When I was first offered the opportunity to review the T-fal OptiGrill I was just as much skeptical as I was intrigued. After all, as a "grilling pro", what could it possibly offer? Well, I was surprised at the results of my extensive review. You can read all about the grill at their web site, but here's my bottom line. This is an 1800-watt indoor grill with six programs that automatically adjust the cooking time and temperature according to the type and thickness of what you're cooking. That all sounds pretty cool, but the obvious question is, "Yeah, but does it deliver?" The short answer is yes. It's about as brain-dead to operate as can be. You look at what you're cooking, set the program, and wait until the indicator light (I call it the magical orb of done-ness) tells you that it's perfectly cooked. In fact, it's so easy that my three girls have come to use it frequently. Now, you might be tempted to think to yourself, "Come on Daddio, it's just a glorified panini press!" Well, I feel ya, but that's simply not the case. There is indeed some kind of electronic wizardry that takes place under the hood. Sure, a grilled cheese or panini is a no brainer, but let me show you two simple extremes that I think will illustrate what I'm saying. 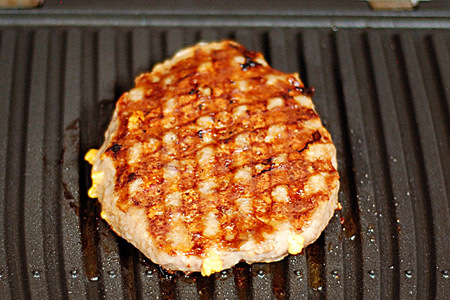 Here's a frozen Johnsonville® brat patty cooked to perfection using the frozen burger setting. You simply pre-heat, set the food in there and wait for the light to get to the proper color for the desired done-ness (in this case well-done). Oh, and there's an alarm that sounds at each level of done-ness. I turned the patty 90° about two-thirds of the way through the cooking process to get those pretty (OCD) grill marks. Yeah, a frozen burger is not all that impressive, so let's turn up the heat (pun intended) to put this thing to a serious test. Let's put a quality steak on this bad boy and see what happens. This was a one-inch thick USDA Choice ribeye that I seasoned straight out of the fridge with kosher salt and fresh-ground pepper. I preheated it on the steak setting, threw the meat in it, closed the lid, and came back 8 1/2 minutes later (medium-rare on the indicator light) to this beautiful specimen. The outside was very nicely seared, the done-ness nearly perfect, and the flavor was great. I cook steaks outside over charcoal all the time and it's very hard to reliably accomplish that with a one-inch steak. Oh, and by the way, I checked the internal temperature of the brat patty and the steak with a Thermapen® and each was dead-on for the advertised done-ness. Another great plus is that the non-stick cooking plates and drip pan come out very easily with the push of two buttons, and they are dishwasher-safe. The clean-up really couldn't be any easier. My only complaint about the OptiGrill is its capacity. At $180 it would be nice if it were larger. For a family of five like mine you have to work in batches, which can be a pain. Other than that, this unit does exactly what it promises and it produces great indoor grilled food. Sure, it won't replace your outdoor grill, but you'll be surprised at how often you'll use it. Our family typically uses ours several times a week. Disclaimer: The OptiGrill set was provided to me at no charge from T-fal, but the review is entirely my own. Nice pic of the steak. We had to use a Foreman grill when we first moved to Knoxville because grills were banned where we lived for the first 6 months. I wasn't impressed with the results but it looks like the T-fal performs much better. Anonymous - Thanks. No, I'm sorry, but there's just one part. 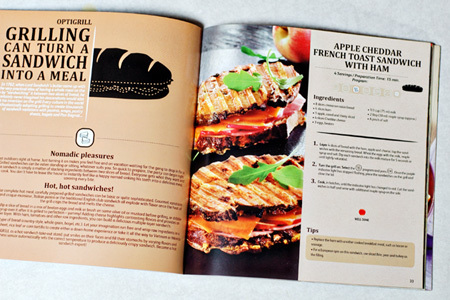 I bought one and I was very happy up until I I found out that you received a recipe book with your purchase. This review is about the company that sells this product, not the product itself! I would say the company is the WORST I have ever dealt with. I'm not someone who has ever posted a negative review, but the company is SO AWFUL I felt compelled to do so. I ordered the product, was not told it was back ordered and when I called to find out where it was they let me know they did not know when I'd receive it. The customer rep was clearly reading off a script and had zero ability to actually listen and handle the issue. Since then I've sent 4 emails and made two calls to try and get the issue resolved. I have NOT had a single response other than an automated email telling me "we are sorry to hear you are not happy"
jjohnsonlee - I'm sorry that you've had a bad customer service experience. I have no affiliation with the company, but I will see what I can do. Just received the grill and it has performed as advertised on my first effort with frozen hamburger patties. After reading your review, I was intrigued!! 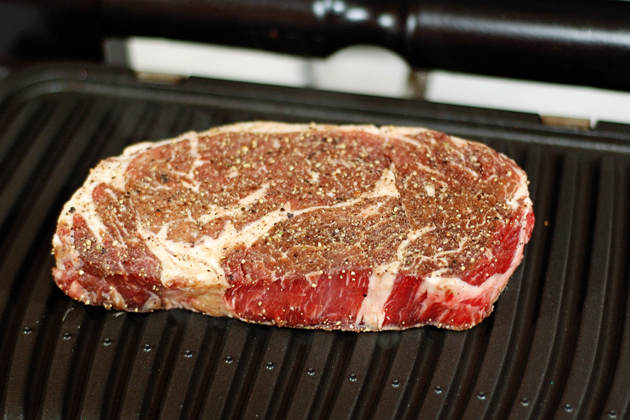 I bought one yesterday and just cooked my first ribeye...........a rare steak cooked to perfection!! This little grill is amazing.......a George Foreman with brains!! Thank you!! This is the ticket for wintertime when I don't want to freeze to death on the deck!! Shannon - Thanks for your kind words. I'm glad that you found my review helpful, and more glad that you're enjoying the grill. It's pretty cool, eh? Try a grilled cheese panini in it. Great review! Something like this would be handy for people who don't have a whole lot of outdoor real estate (like apartment or condo dwellers). How much smoke does the unit put off during the cook? Wayne, while grilling my rare ribeye I had just a whisper of smoke!! Not sure what would happen if it had been cooked to well done. No smoke with a grouper filet either. You are right, this is perfect for the apartment or condo dweller!! I have purchased two more to give as Xmas gifts. One is for a 92 year old gentleman that loves a good rare steak but hates to drag the grill out just to toss one steak on it!! I cannot praise this unit enough!! Wonder if there is a way to get a good smoke flavor with this unit, other than liquid smoke? Anonymous - It's an indoor electric grill, not a smoker. If you want true smoke flavor you've got to take it outdoors. Er, by "take it outdoors" I mean the food and cooking, not the OptiGrill. Thanks for this review. I just ordered one and can't wait to try it!!! Anonymous - I've cooked several steaks in the grill and I've never had a problem. Did you use the steak setting? That's the only thing I can think of. Anonymous - You control the doneness by leaving the steak(s) in the grill until the indicator gets to the proper color (orange for medium). It sounds like you're simply taking them out too soon. I've read comments about the indicator light now working with thicker steaks. Have you tried it with 1.5" or 2" steaks? Or what about bone-in steaks like a rib-eye (my fav)? Ben - I've not tried cooking steaks thicker than about an inch, and T-Fal doesn't recommend cooking bone-in meats in the OptiGrill. Thanks for your honest review. I'm a steak lover who lives in an apartment so I don't have access to an outside grill. I tried using a cast iron skillet but couldn't deal with the smoke and grease splatter. I also tried the George Foreman grill. The problem is that since the steak cooks so fast on both sides you can't get a good sear on it. You have to use a really thick steak and hope for the best. I read every review and saw every demo I could find online. Your review states the same thing. 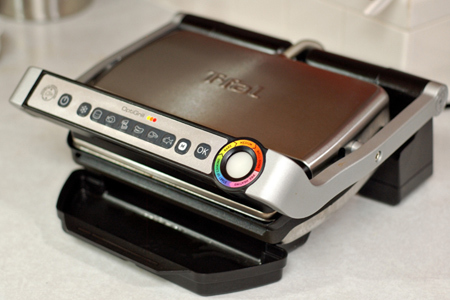 The T-Fal OptiGrill works if you follow the the instructions. Thanks for helping me to decide to purchase this item. :) FYI, it's also recommended to wipe the grilling plates with a cooking oil soaked paper towel before use. Anonymous - Thanks, I'm glad that you found the review helpful. Please swing by again and let me know what you think after you've tried it. John, thanks for your quick response. I did purchase this grill. I grilled 3 pieces a little over 1" thick of fillet mignon to check out the rare, medium and well done settings. 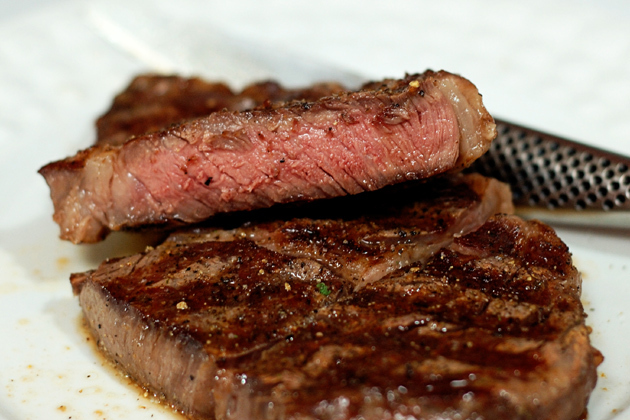 For good seared steak it's recommended to pat your seasoned or marinated meat dry with a paper towel before grilling. I sprayed the grilling plates with an olive oil mister that I purchased with the grill. It works great! I keyed in the proper setting. The preheat function seems to be the longest part of the cooking process. After the beeping I put on the steaks on walked away and let the grill do the cooking. Beeping again my rare fillet was done. It did put the seared grilled marks on the steak and it was cooked somewhat rare in the middle. The medium and well done steaks were also cooked appropriately. As far as the taste, it was pretty good not great. I think a steak with more fat in it would taste better on this grill. Fat equals taste! I tried precooked bratwurst sausages. They were great! Seared well and hot and juicy. I tried the manual mode and grilled a big hunk of, once again, fillet mignon. I seared it on all sides. It came out great. Seared very well and nice and rare inside. Like any cooking, doing it yourself is still the best, but you can't beat the ease of operation of this grill. How else can you cook a steak and walk away and just wait for the beep. It works! It's well made. I'm impressed with the sturdy giant hinge that's easy enough to clean around it and the industrial spring wrapped power cord. A good buy! Thanks again John. Anonymous - Thank you for your very detailed follow-up. I'm really glad that you are enjoying the grill. Does anyone know why it keeps coming off the chicken setting to the manual setting? Anonymous - I think it goes to the manual mode if you leave the meat in past well-done. Just purchased one last night. Cooked marinated chicken tenders, awesome. Also cooked fresh asparagas with olive oil, salt and pepper, delicious. I am so impressed, can hardly wait to get home tonight and try grilled eggplant. I love it. I have found that to sear meat properly, you need to allow it to continue to pre-heat, even after it tells you it is ready. The other thing is that the meat must be ready to put on because you want to QUICKLY open, place meat, and close. Don't wait to season..have it completely ready to place into the grill and close it right away. I bought this from belk's about 2 months ago and love love love it! I use it everyday and would love to get extra grill plates for it to switch back and forth between cleanings. It does everything they say it do and i've never had a problem cooking anything. I have giving away my outdoors grill which i hardly ever used anyway. You can't go wrong with this one at all. Anonymous - I'm really glad that you're enjoying the grill. I've really enjoyed the optigrill so far. My only question is does anyone else's seem to give off a lot of smoke on the pre-heat? I thought it would burn off after the first use, but it still continues. I just bought my Optigrill and am studying all comments before my first use. My main question is..do you have to grease the plates every time before all cooking? Anonymous - No, I don't. I've had mine for about 3 months now and absolutely love it. It makes cooking steaks or hamburgers easy with everyone liking a different level of doneness. I purchased it from the Info-mercial and have used many of the Omaha Steak coupons. One key is to make sure that if you are starting another item to cook (like another hamburger) after you have already cooked one, that you turn it off and start fresh - I noticed that if you don't do this step that it seems to always go to manual mode. Thanks John for your excellent review but i think everyone should buy electric smoker instead this one . am i right John ? younus - No, I would have to disagree. An electric smoker is fine, but this is and indoor grill. Each serves an entirely different purpose. Anonymous - No, I'm sorry, I don't know what the problem might be. I'd recommend that you contact T-Fal. This grill is great, but I seem to always end up with a few puddles of grease on the countertop under the back end of it. We used ours once, it worked just as it was supposed to. Tonight, it goes straight to Manual even though we pushed the meat button. The indicator stayed white the whole time. What did we do wrong? Too expensive for this to happen second time out. Anonymous - I don't know what could have happened. I'd recommend that you contact T-fal. Have you contacted T-fal? This isn't a support forum. Wasn't asking for support..I bought one after reading reviews like yours that help me decide if this was worth buying...just stating that what happened to me seems to be happening to more than one machine, so buyer beware. When it actually does work, it's great!! !...otherwise you are standing there watching a $200.00 grill. Of course I contacted T-Fal, surprise I had to leave a message and of course it will take them a few days to get back to me. So much for that GREAT Christmas gift that can't be used. We had the problem of the machine getting "stuck" on manual. If the grill plates are not properly seated the grill will default to manual every time. We adjusted the grill plates and have never had a problem again. We love our grill and bought one for my parents as well. They have cooked chicken breasts from frozen and they turned out perfect. We had the same problem and I realized that we have to first start it without putting the meat in it, until it gets ready (gets Pink) and beeps, then putting the meat in. Yeah, the instructions are pretty clear about preheating the grill. The problem with switching to Manual is becoming increasingly common - we have 2 Optigrills and the newer one (just 4 weeks) has developed this fault. Switching the plates between the machines makes no difference and they are seated exactly the same on both. Mr Google has a number of reports of this from various countries - I suspect T-Fal have switched to a cheaper manufacturing facility and saved themselves a few pennies....bad move in my book! I love my optigrill but am confused about cooking things with bones. 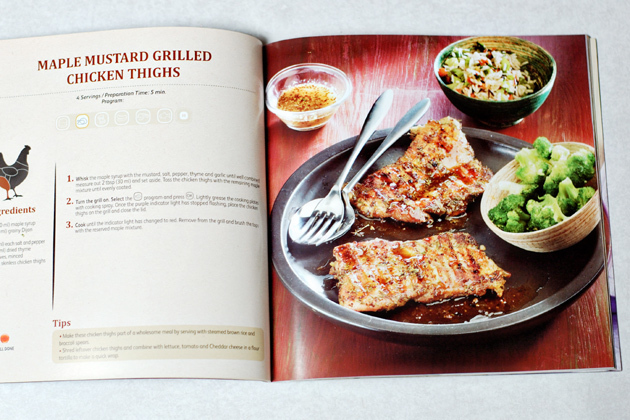 It says not to use bone-in meats but one of the recipes in the book calls for bone-in chicken thighs. What gives? used it once was fantastic. Now everytime Itry to use it, immediately onto manual mode. Turn it on ready to pre-heat, press frozen, press chicken, press ok.. manual mode. The lat time I tried it and it was actually preheating ok i went back to it after 2-3 minutes and it had gone into manual mode during the preheating... pretty gutted tbh, Fittings are full secure and cleaned but it is just refusing to measure anything. I would recommend keeping the warranty very close by. Anonymous - Did you see the following from a comment above? 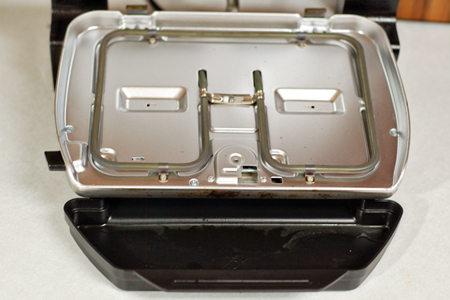 "If the grill plates are not properly seated the grill will default to manual every time. We adjusted the grill plates and have never had a problem again." Wow I'm so jealous I bought one and cooked steak in it to medium rare. Came out Well Done. I'm not dumb I followed the colors it was yellow with a hint of orange. BAM well done. So I waited a wkk did chicken. Dried it out. It did do well with fish, veggies and as a panini press, but I will not be using it for nothing other than that. Clearly I have a defective one. Manual mode issue seems to be fixed on our T-fal grill by selecting the mode and OK button with the top raised. Placing the food to be cooked on the grill when it it warmed up and then lowering the lid. Will see how it works out long term. 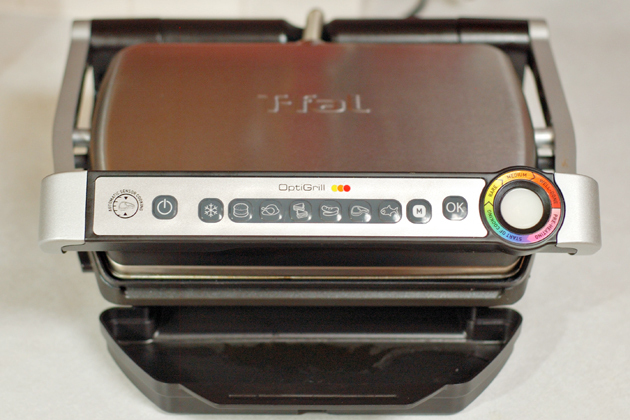 The T-fal grill is fantastic when it works in automatic mode. Mine worked great for a while. Then we noticed the bottom of the meat did not have any seared marks. Sent it in for repair. Did not get to use the grill for at least 6 months. Same problem now but out of warranty The meat is cooked as desired, just no seared marks on the bottom. I usually opt for a good old fashioned electric smoker because I don't believe there will be anything that can replace smokers. But the pictures do look quite good so might have to look into this grill a bit more! Had a problem with my Optigrill jumping directly to manual. Called the support line and learned how to reset the unit where it does not jump to manual. Takes about 2 minutes to correct. Wrote the procedure down just n case it happens again as I suspect it will. What was the procedure then? Ours has just started it now. Why would you not post the procedure to help everyone? Yes please... What's the procedure? Well, have used it for 6 months now and loved it, but now its only working in manual mode. Contacted CS, no help. #140.00 bucks wasted. Glen - Did you see this above? "We had the problem of the machine getting "stuck" on manual. If the grill plates are not properly seated the grill will default to manual every time. We adjusted the grill plates and have never had a problem again." Folks, again, this isn't a customer service forum. 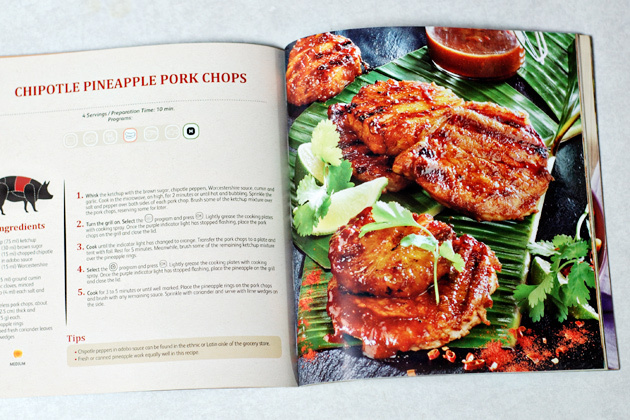 The grilled meat looks just great! My wife loves grilled and smoked meat and I love to cook it. It's important to have the best natural gas grill. First kitchen gadget I've ever purchased that my husband keeps asking me to use! We love it! We use this gadget for more than 1 year and everything is O.K. The fish, the meat are great! Does anyone know how to reset the optigrill? I have adjusted the plate plenty of times but that doesn't seem to work. There is a way to reset the grill. I think that may work. It works O.K. for me. We use it for 1 year. Everything tastes good, meat, vegetables, fruits. Used it once now goes to manual every time. Tried reseating plates, whatever that means, but no guidance as seems ok to me, but still goes to manual. Any fix for this? I sometimes have the same problem with the grill jumping into manual mode after selecting an automatic mode. What works for me is to turn the grill off, turn it back on, select manual mode, hit OK, turn it off again, turn it back on, select the automatic mode then select "OK". It then usually stays in automatic mode and works correctly. I suspect that the "manual" mode button is faulty and closes its own contacts on occasion. Thanks Larry. I'll give that a try! I have been very skeptical about these types of grills after my experience with the Forman. However, this one looks like a step up that is worth a try. Thanks for the information! I have just bought the optigrill. As one of many totally blind users, I appreciate the range of cooking presets and the audible indicator of device and cooking status. 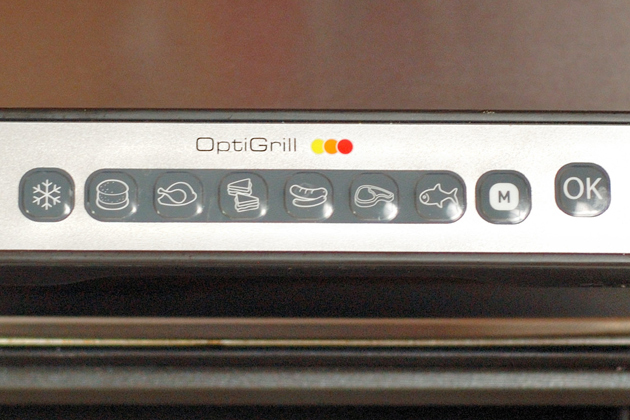 Other than my talking microwave, I don't think I've seen as accessible and usable a kitchen appliance as the optigrill. I love somking, one question, can I use electric smoke to do the same thing? Cynthia - I'm sorry, but I don't know what electric smoke is. Can I make grill for any kind of meat with this? Marie - I'm sorry, but I don't don't understand the question. 1. Hold down all three buttons at once ( burger, fish and manual buttons for 3 sec until the steak flashes 3 times and goes solid. 3.push steak button it will flash 3 times and go solid. Unplug unit. 5.plug unit back in close lid and it should be recalibrated. If it doesn't work it's broken contact customer support. but only sausages light + white blinking , that's all. Any ideas? Pretty clear information here...Smoking is one thing i love doing, esp porks, meat and chicken :). Have you tried using the Masterbuilt 30''? Its much better. Can you cook breaded chicken breast on this grill? Anonymous - I suppose you could, but I don't know why you would. Try it, they're pretty cheap. I haven't tried this electric grill yet but I'm thinking of getting one for the kitchen. It seems to get pretty good reviews online. I love grilled and smoked food and have electric grill already at home but i am now planning to have this grill for my outdoor grilling passion. I haven't tried this electric smoker as yet. Have you tried the Masterbuilt or the char-broil one?? They are pretty good too. This is a grill, not a smoker. I've never tried an electric smoker. My optigrill+ would only work in manual mode. The instructions above are incomplete for the reset of an optigrill+. Here is a link to instructions I found on youtube, if you follow them exactly, it will work if all you need is a reset.